HIPPOCRATES, GALEN, Avicenna and other ancient physicians frequently used odour as a diagnostic tool. Although scent is not used nearly as often in modern medicine, it still has its place. Paramedics are routinely taught to spot the fruity smell on the breath of diabetics who have become hyperglycaemic and gastroenterologists are trained to detect the odour of digested blood. But there has been scant evidence of a smell associated with neurodegenerative disorders. Now one has been found for Parkinson’s disease. Frequently causing tremors, rigidity and dementia, Parkinson’s is both debilitating and substantially shortens life expectancy. The rate at which these symptoms appear and worsen cannot be stopped or slowed yet but its most harmful effects can be staved off with drugs. As with many diseases, the earlier the intervention, the better. Yet herein lies one of the greatest challenges—there are no tests that diagnose whether Parkinson’s is actually present. The best that neurologists can do is study the symptoms and theorise about whether someone actually has the disease. Hence the search is on for a better form of diagnosis. Unexpectedly, scientists are now literally following someone’s nose. Upgrade your inbox and get our Daily Dispatch and Editorʼs Picks. Joy Milne, a retired nurse from Perth, Scotland has an extraordinary sense of smell. Known as hyperosmia, Mrs Milne’s condition allows her to detect odours that are imperceptible to most people. In 1974 Mrs Milne noticed an odd musky smell around her house that had not been present before. In 1986, her husband, Les Milne, was diagnosed with Parkinson’s. He lived with the disease for a number of years and while the symptoms were initially manageable with medication, this became harder over time. Eventually, he was forced to retire and, while attending Parkinson’s support groups, Mrs Milne noted something extraordinary. Everyone with the disease had the same distinctive odour that her husband had developed in 1974. It was shortly after that realisation that she started collaborating with researchers. 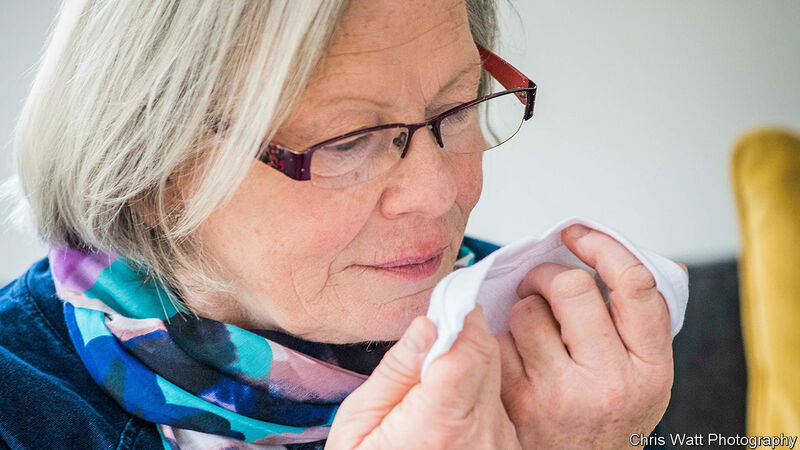 By providing Mrs Milne with shirts worn by Parkinson’s patients, researchers found she was able to identify that the smell was concentrated along the upper back, and not in armpits as previously assumed. Most remarkably, of the control subjects without the disease, Mrs Milne found one to have the musky odour. Nine months later that person was diagnosed with the disease. All this led Perdita Barran of the University of Manchester, in Britain, to set out to discover what was producing the telltale odour that Mrs Milne could detect. Previous work found that patients with Parkinson’s had a tendency to overproduce a waxy compound on the skin of their upper backs. Known as sebum, Dr Barran speculated that something trapped within this compound was producing the odour. Keen to find out, Dr Barran and her colleagues set up an experiment. The team analysed sebum samples from 43 people suffering from Parkinson’s and 21 who were not. The sebum samples were collected on gauze and warmed to release any volatile compounds that might be found within them. Mass spectrometry and gas chromatography were then used to identify whether there were volatiles present and what they were. For a subset of the patient samples, Mrs Milne smelled the compounds before they entered the mass spectrometer and pressed a button when the distinctive odour was present. As Dr Barran reports in ACS Central Science, the mass spectrometer identified four compounds, perillic aldehyde, hippuric acid, eicosane and octadecanal, in the vaporised sebum of the Parkinson’s disease patients that were at entirely different levels to those in the healthy group. To test whether these different levels of compounds were generating the smell that Mrs Milne was detecting, Dr Barran presented them to her and confirmed that they were, indeed, responsible for the musky odour. While relatively small in size, Dr Barran’s experiment is the first to reveal the specific compounds that generate the unique smell of Parkinson’s. Assuming larger follow-up experiments replicate her findings, the work paves the way for the development of a device, a sort of electronic nose, that could sniff the upper backs of patients to quickly determine who has the disease and who does not. That would allow drugs to help mitigate the symptoms to be administered all the sooner. 19 Yea, for food and for raiment, for #taste and for #smell, to strengthen the body and to enliven the #soul. 20 And it pleaseth God that he hath given all these things unto man; for unto this end were they made to be used, with #judgment, not to #excess, neither by #extortion. Extortion is the key word here. I take it to mean, "not squeezing more out of a natural thing than you should". Here's an example: #Feedlots. Does it sound right for thousands of #cattle to be corralled into a tiny space - not even able to move really, where they are fattened up to be slaughtered? All kinds of diseases can take hold- it's not "natural", not the way God intended. I wonder how healthy stressed out meat like that can be. Or how about #chickens in cages, never being allowed to roam, just so they can collect #eggs. I wonder how healthy those eggs are. Or #Crisco. Can anyone explain the natural process whereby Crisco is created? no. because it isn't natural. Or " #Milk ". Or should we say "milk product": #homogenization is the process where they whip the milk to get rid of the lumps (of fat). #Pasteurization is the process where they heat the milk to kill bacteria. If #raw ( #unpasteurized ) milk is so dangerous, how on earth did civilization survive nearly 6,000 years without it? It's a hoax. Have a milk intolerance? I don't. Most people begin to have one around age 40. I think it's because pasteurization kills the good bacteria that helps digest the milk. After 40 years of drinking that nasty stuff, I bet your gut just cries "uncle!" and stops processing it. Have a #skin #allergy or #arthritis? One of my students had bad #eczema. I asked him what kind of milk he drank- he didn't like milk. I said, "you want to get rid of your eczema?" "yeah." "Ok, you have to do what I say. Eat #yogurt every day, and come back and see me in a week." A week later, he's all excited that his eczema has completely cleared up. My theory: yogurt contains some of the bacteria that helps us #digest / break down the milk. See, homogenization makes the globs of #fat so small that they can pass undigested through the walls of the intestine. I believe the body's #immune system sees the undigested fat as a foreign invader and attacks. Since the fat settles in the bone joints and skin of the body, those places get inflamed as the body attacks the foreign entities. raw milk naturally contains the necessary #bacteria to digest the milk. Not everyone can drink milk, sure, but if you could at one time, and can't now, try drinking raw milk, or adding yogurt to your diet. But all this can be solved by eating "close to the ground" (unprocessed) and natural (not extorted) food. A key reason why wild #yeast is MUCH, MUCH BETTER is that during the rising process, it changes the #flour into a more nutritionally superior product. You see, #grains carry with them #anti-nutrients that PREVENT them from breaking down. Have you ever wondered why grains can be stored at room temperature without breaking down and going bad? They are built this way. They resist #decomposing, which is great for when you want to store grains for a long period. But it’s bad when you want to eat them. Grains (and their flours) need to be broken down properly in order to fully provide us with all the nutrition they carry. Also, when you make #homemade #bread with wild yeast you can forget about any digestive discomfort, because there is none. The inherent problem with today’s commercial yeast is that since it is ONLY the isolated active ingredient of yeast, not the full wild yeast itself, _it only rises bread without breaking down any of the phytic acid or anti-nutrients to aid with digestion. You get a quick rising bread with store bought yeast, but you don’t get the health benefits that are produced with wild yeast._ Wild yeast produces a slower rise, but you get a PERFECT loaf of bread, the way nature intended. There it is again- we've extorted the rising agent of yeast, without including the ability to break down the #phytic #acid or #anti-nutrients.